This module exploits a memory corruption flaw in Internet Explorer. This flaw was found in the wild and was a key component of the "Operation Aurora" attacks that lead to the compromise of a number of high profile companies. The exploit code is a direct port of the public sample published to the Wepawet malware analysis site. 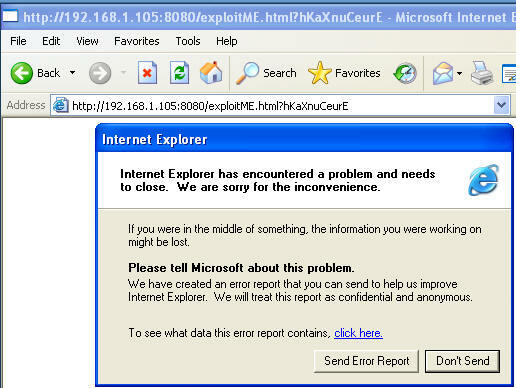 The technique used by this module is currently identical to the public sample, as such, only Internet Explorer 6 can be reliably exploited. For those of you that do not have access to my class, Instructor VM is a Windows XP Operating System. For those of you that do not have access to my class, Instructor VM is a Windows XP Operating System running Windows Explor[d]er 6. When you see the below window then you know you will be ready. The above command will show all exploits related to aurora. This command will tell msf which exploit to load. NOTE: Your command prompt will change. The payload is the actual code that will run on the target system after a successful exploit attempt. Use the show payloads command to list all payloads compatible with the current exploit. Where 192.168.1.108 is the IP address of WindowsVulnerable01. Please refer to step 4 in the prerequisite section to obtain the IP address of WindowsVulnerable01. This will be the name of the webpage file the mis-informed user with Windows Exploder 6 will click on. Place website address http://192.168.1.105:8080/exploitME.html in the address bar. Click Go or press enter in the address text box in which your address is located. After your Windows Exploder tries to load the web page it will become un-stable, crash, and you will see the below Microsoft Message. Cut and Paste a screen shot that looks similar to Step #6 in Section 4 into a word document and upload to Moodle.